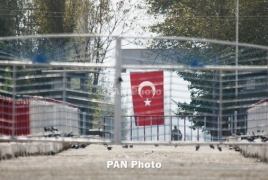 PanARMENIAN.Net - Border guards of the Russian Federal Security Service in Armenia have detained a group of people who were trying to illegally cross the Turkish border, the press service of the Security Service said. According to preliminary data, those detained were citizens of India and were caught while attempting to cross the border to Turkey on Wednesday, November 7. None of them had any documents but carried backpacks and had some cash. The trespassers have been transferred to law enforcement bodies of Armenia, in compliance with the country’s legislation.